Lloyd Hughes is a 4th generation metalsmith who has been perfecting his craft for 40 years. 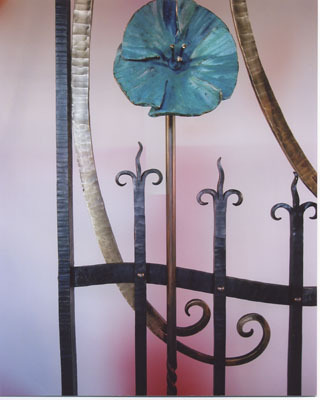 In 1982 he studied with master blacksmith Bill Valerius in Chicago. He began Lloyd K Hughes Metalsmithing in 1987. In addition to his work in Kentucky, Lloyd has completed extensive commissions in Florida and Georgia. His work may also be found in numerous other states. Lloyd is a juried member of the Kentucky Arts Council's Kentucky Crafted program and the Kentucky Guild of Artists and Craftsmen and is showcased in Southern Artistry, a website of outstanding Southern artists. Lloyd has been very involved in the National Ornamental and Miscellaneous Metals Association (NOMMA) including serving as its president in 1993. In 2002 he helped create the NOMMA Education Foundation for the purpose of expanding education within the ornamental metals industry. He served as the Foundation's first chairman. NOMMA awarded Lloyd with the Frank Kozik Volunteer Service Award and the Clifford Brown Education Award. Lloyd also teaches kinetic art classes thru Lexington's Living Arts and Science Center at the Center and at local elementary schools.